These muffins are perfect for a special Sunday brunch, whether for Easter (like today) or any other “impress your guests” type of occasion. At first I was put off by the confusing aspect of how to eat them (muffin says hands, syrup says fork) but then I realized that essentially it’s a fluffy yet substantial pancake, so of course a fork is the right (only) choice. These had a really lovely texture and paired perfectly with the strawberry-maple syrup. You don’t hear all of the “Oh no! 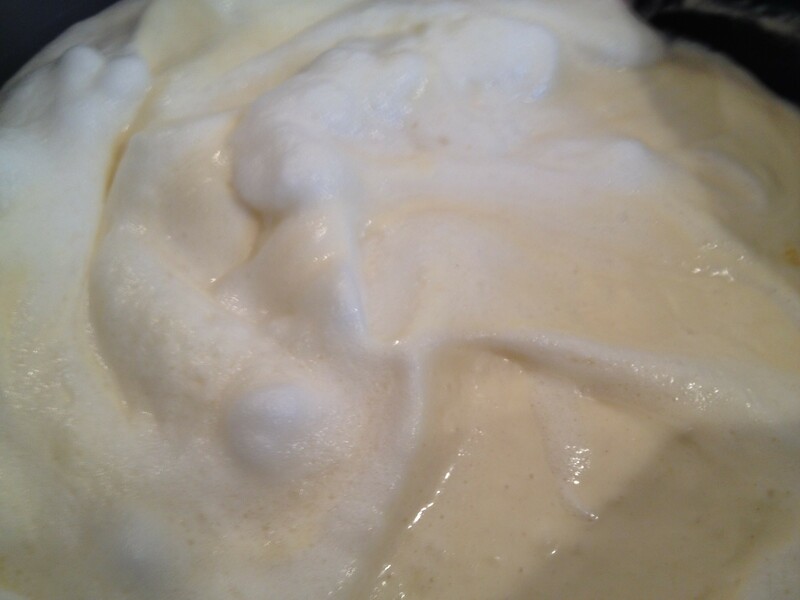 My souffle is falling!” jokes these days like in my childhood (and happy that comedy has progressed beyond failed souffles and the old pie-in-the-face), although I did have a bit of a panic that my souffle muffins would fall/fail. But behold! They are risen! I won’t quite call it a miracle as much as a meticulous following of directions, though. 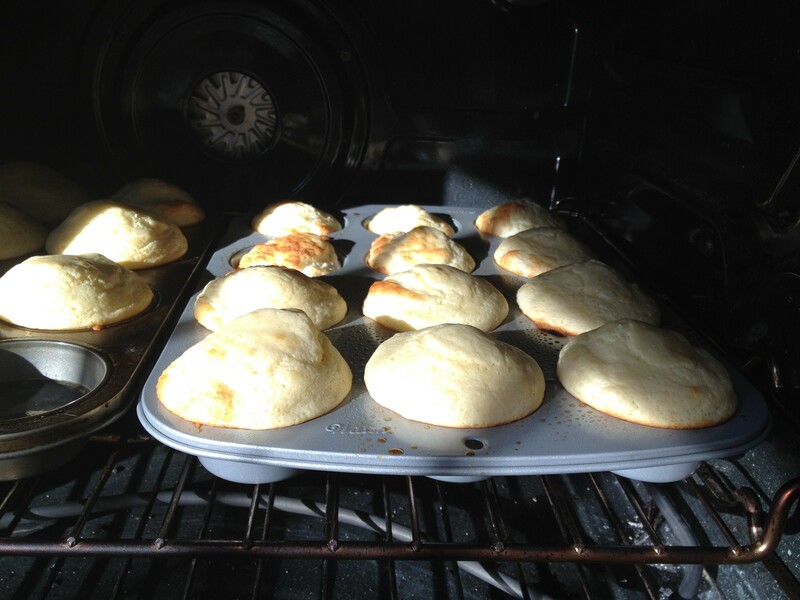 Make the MuffinsPosition a rack in the center of the oven and heat the oven to 400°F. Liberally spray two 12-cup muffin pans with the cooking spray. Make the syrup While the muffins are baking, bring the maple syrup to a boil in a small pot over medium-high heat. Put the strawberries in a medium serving bowl. Pour the syrup over the berries and set aside in a warm spot. 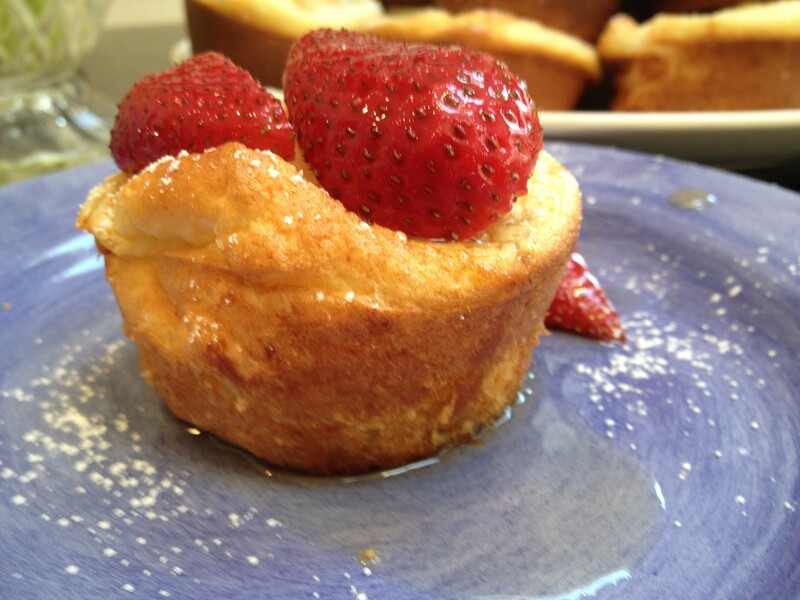 Serve With an offset spatula, pop the muffins out of the cups and arrange on a platter. Sprinkle with confectioners’ sugar and serve with the syrup. This entry was posted in Main Dish, Side Dishes and tagged Easter brunch, muffins, pancake souffle muffins, strawberry maple syrup, Sunday brunch by Mom Mom's Apron. Bookmark the permalink. Thanks, Kath! Same to you. My mouth is watering – going to try these tomorrow! Wonderful legacy you are passing on to your family. Kids will remember all the great food they had growing up.